For the past several years I have selected a word to structure my goals around. For the past two years that word was ‘intentional.’ The second year of being intentional was ok, but not wildly successful. 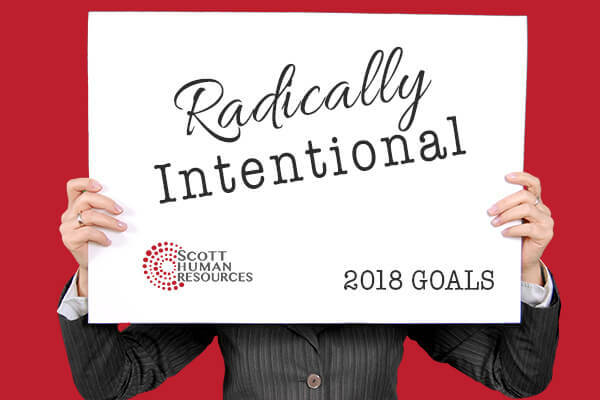 However, I recently listened to a presentation where the speaker combined two words, ‘Radically Intentional.’ Wow, now that is something I can hang onto. Living intentionally means living with purpose, forethought and planning. For me this means that I recognize that every decision to do something is a decision to not do something else. Saying yes to volunteering on a committee means saying no to other opportunities. As a passionate person, the word radical appeals to my emotions and attitude. Radical is extreme, different or not typical. Radical brings a fundamental shift to the way I consider being intentional. Radical means my intentionally goes the core and lies at the root of every decision I make. For one to embrace being radically intentional, goal setting is a must. There is no reason to plan or make deliberate decisions if I don’t have big picture goals to achieve! With the passing of another year, I realize that I must start achieving goals or time will simply pass me by. Relationships: the core of everything. We were designed for relationships. And to maintain positive and encouraging relationships, we must be intentional to touch base from time to time- this includes managers sitting down on a regular basis with their direct reports to verify their successes, challenges and how we can support them better. This can extend to spousal and children relationships as well. Money: Each year brings new challenges and unexpected hurdles. We have to set aside cash reserves for those unexpected hurdles, make proper investments for the long-term and evaluate each year on its own merit. Just because you spend X amount of dollars in one budget area this year; does not mean you spent the same the following year. Remember, you can’t have too many goals or you will become overwhelmed and not accomplish any. Simply identify three or four goals with the year end result written down. Then break the annual goal into quarterly goals so you can measure if you are on track. Yes, sounds simple! But how exactly do you measure relationship goals? I am going to be radically intentional to schedule time just to call family, friends and touch base with clients – not for the purpose of anything, but to say hi! With my time, I am going to include others prior to making a commitment to evaluate if we (I) have the time and resources for another commitment or project. Money: this is easy to measure. What is your savings goal, retirement investment goal, cash reserve goal- break that into 12 months of “payments” and start now. So there are my goals for 2018. Want more tips for achieving your goals? This article focuses on how 8 percent of people actually complete their annual goals. One of the factors that improves your ability to achieve your goals is accountability. To tap into the advantage of accountability, just share your goals with someone! You can share them with me in an email, post them on Facebook or put them in a comment on this article. This is one of the simplest ways to get motivated on your goals. Need help identifying and structuring your goals? Want a timely accountability partner? 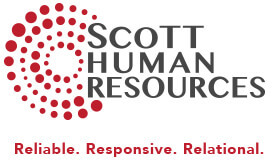 Scott HR can do that! Email or call me today at 785-272-5410 to talk more about goal setting and leadership coaching. Seize the day! There is no time like the present to be Radically Intentional.